The manufacturer of the popular LaCroix carbonated water beverage kept advancing as investors relished its expansion in a growing market. So what: The beverage manufacturer and marketer is attracting significant investor interest due to a growth rate that's far in excess of the global non-alcoholic beverage industry. The industry is currently projected to expand at a rate of just 4% in 2016. 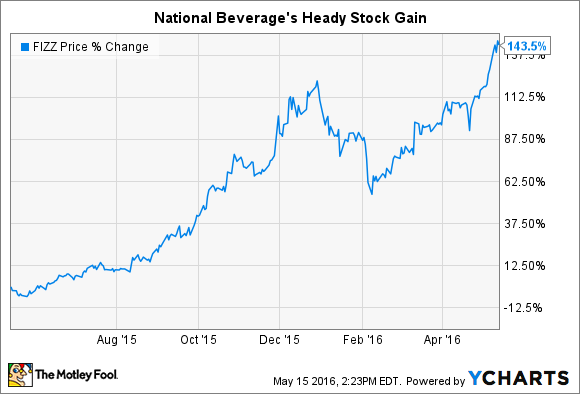 In the first nine months of National Beverage's current fiscal year, the company increased revenue at a pace of 9.2%. During its most recently reported quarter, revenue rose by 13.1%, a sign that growth is accelerating. National Beverage's top-line momentum has been shouldered by its LaCroix brand of sparkling water, a recent breakout hit. Like more expensive competitor brand Perrier, LaCroix is marketed to consumers turned off by traditional sweetened sodas -- it's essentially carbonated water and natural flavoring, with no added sugar. Building on this success, National Beverage has recently launched a naturally flavored version of its flagship Shasta carbonated beverage line, called "Shasta Sparkling," which the company designates as a "SDA" (soft drink alternative). Behind National Beverage's powerful stock rise may be a sense among investors that it's plumbed the right market at the right time. The market for flavored water is expanding at a pace you usually only see in a subsector of the technology industry. According to Chicago-based research firm Mintel, the sparkling/mineral/seltzer water segment is expected to grow cumulatively by 75% between now and 2020. Tapping into a popular movement away from carbonated soft drinks has also afforded National Beverage a bit of relative pricing power, even as it markets its beverages as less expensive alternatives to the soda labels of multinational conglomerates. In the first nine months of the company's current fiscal year, operating income margin grew by 20%, and net income improved 17.7%. Now what: National Beverage's stock has been on an undeniable tear as of late, with no small amount of accompanying volatility. Expect as much to continue. The company presently trades at a price of 44 times trailing-12-month earnings. That's a premium of about 50% to the average price-to-earnings valuations of industry stalwarts Coca-Cola, PepsiCo, and Dr Pepper Snapple. Shares reached vertigo-inducing heights in extremely short order, and investors shouldn't be oblivious to some near-term price risk.